Help fund the publishing of Every Minute is a New Day: The Language of Dementia on Kickstarter today. Only a week left to help. We’re halfway to our goal. With your help we can make it by the 22nd of August. All funds go directly towards the publishing and marketing of the book. Once the book is published 20% of all royalties will go to support Alzheimer’s research and education. Every dollar counts. Tell your friends and coworkers to give $1 or $5, no more than a latte. Together we can ensure that the people have a positive message about dementia so we can change the conversation, challenge the stigma. 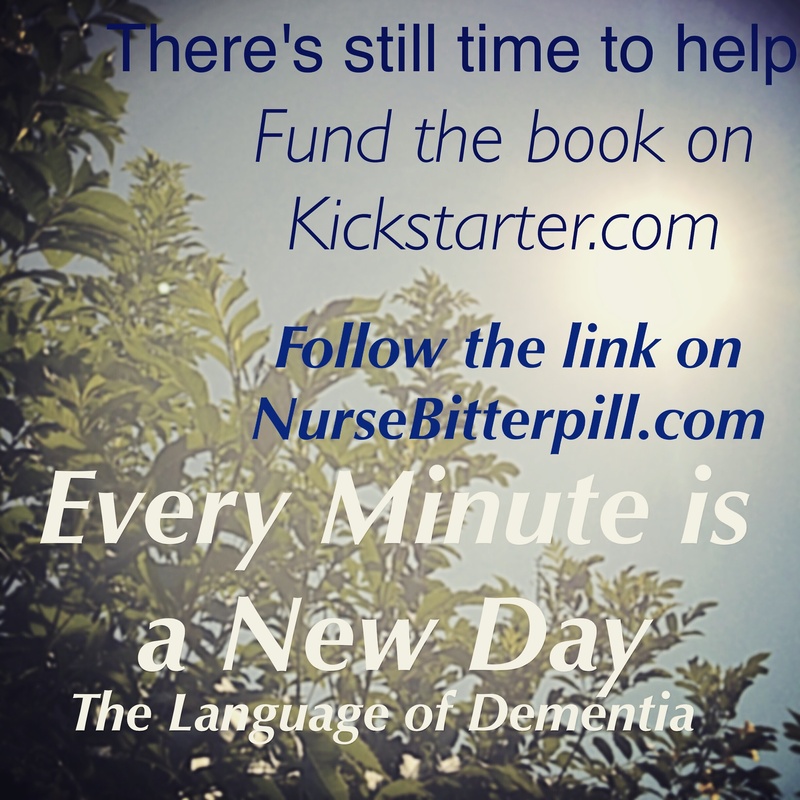 Click here to back Every Minute is a New Day: The Language of Dementia. Thank you all do much for your ongoing support. Nurses are supposed to be the unsung heroes providing care, quietly doing whatever is necessary. Nurses have always kept the secrets of our society, keeping level heads in crisis. One of the biggest secrets is that Alzheimer’s is not tragic all the time. There is laughter, there is love. And I’m tired of being an unsung hero. I want to be a loud, boisterous, unconventional hero that sings terribly and off-key. I want you to hear my voice about Alzheimer’s and Dementia. If you have Alzheimer’s, you have permission to be happy. 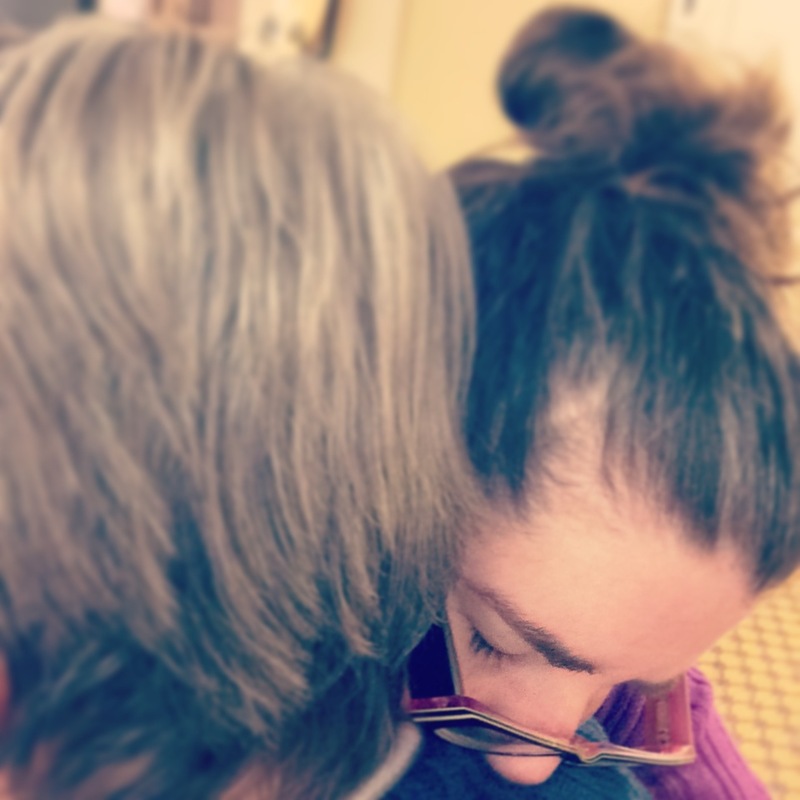 If you are caring for a loved one with Alzheimer’s you have permission and a right to feel joy. Quit letting society tell us we are unsung. Raise your voice with Nurse Bitterpill in shattering the stigma of Dementia. There will be tragic moments. But the joy can easily outweigh them if you stay open to allowing them in. I have a plan. I will be making a lot of noise. Make noise with me. Nurse Bitterpill is in the process of publishing a book, Every Minute is a New Day. It is a long process (longer and more involved than I had anticipated). And an avenue to be vocal on behalf of my beautiful and joyous Alzheimer’s patients. It will not happen instantly. I do not have the luxury of cloistering myself away for six months without distraction to focus fully on writing. I am elbow deep in the real world of dementia every single day. In the trenches making life better for those suffering and have the audacity to be happy about it. I don’t want to stop at just writing a book. I want to keep raising my voice with film, education, mentorships, and other forms of media to get the word out that we can still smile, laugh, and live after a diagnosis of Alzheimer’s. With a new business on the horizon, I plan on making everyone hear what I have to say even if means standing on street corners shouting to passersby that people with Alzheimer’s have a right to be happy. I am not fearless, I am determined. But if we all join together, we will be heard. The launch of the new Kickstarter campaign for Every Minute is a New Day is approaching. Help me raise awareness and remove the tragic stigma of a Dementia diagnosis. Stay tuned for details. 13 More Days to Meet our Goal. There are more features that I am pursuing in the publishing process. But this is what I am aiming to accomplish with kickstarter funds. “Hope is a force as fragile as it is enduring. Hope and fear are forever entwined, not always on opposite sides of the spectrum. Hope can fuel fear and fear can fuel hope.” -Every Minute is A New Day. 17 days left to help fund the book. Tell your friends, tell you mom. Let’s make this happen. Be a part of this message of hope. Click here to help fund the book. As little as the cost of a latte can help.